Here is another weeknight dinner we learned from my sister-in-law. My husband usually cooks this one. I don't like standing over the stove stirring things. It's hot, and smelly. I much prefer slicing and dicing and all the prep. 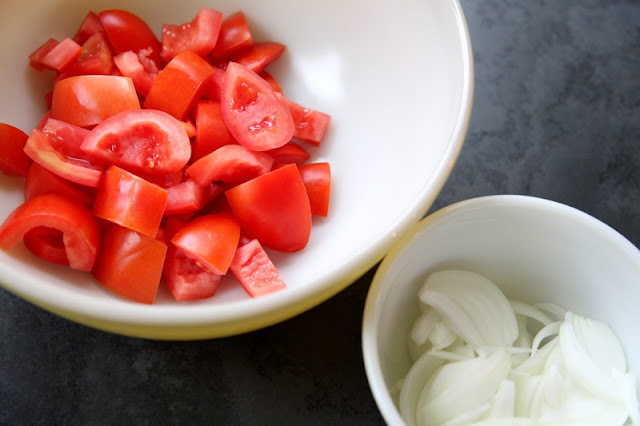 So last night I chopped the tomatoes and onions, assembled the other ingredients, and when my husband came home, he stir fried everything up! Thanks again for the recipe Fae (do we make it the same way?)!! I love having dinner at your place! 5. 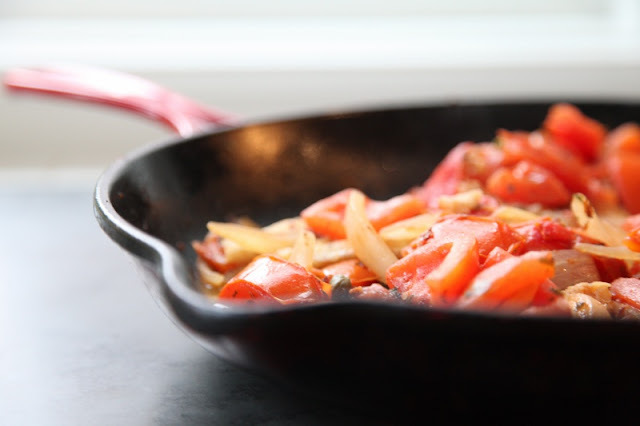 Add capers, some parsley and fish to the pan (with tomatoes and onions). Let everything simmer for a bit. We ate this over white rice. *My husband doesn't like salmon. This recipe you describe above, I would fry the onions first, remove them and then add the fish - that way the fish would get some of the onion flavour - but that's just me. I have a great and simple fish recipe. Get a large trout - lay it on a foil covered cookie sheet skin down. Season with a bit of salt and pepper. Set oven to broil. In a bowl, whisk together 1tbls of honey, soy sauce, Worcester sauce and a tad of lemon. Add pressed garlic if you like. Pour over trout, making sure to cover all of the fish. Put in oven and broil about 10-12 minutes - check if thickest part of fish is cooked. My kids eat half a trout this way! That is Billy's favourite dinner EVER. This is awesome. I only ever bake those frozen fillets. This is a great new option for me. And seems easy enough. Thanks! I'll definitely be trying this one out! We are not big fans of fish.....but this dish looks really yum....does it have a strong taste of fish though? Mmm...love tomato season! Awesome photography and recipe Shannon! Very easy! Try it out! I haven't had anything with dill in a long time...now I want a pickle! I am going to flip through the Jamie Oliver cookbook tomorrow! Our favourite fish recipe is blackened sea bass. If you really want to do it well you can Google a recipe for blackening spice and make it yourself, but we just buy Paul Prudhomme's pre-made version and cover the fish all over with A LOT of it. You then sear it in a cast iron pan on high heat on the stove top. I do it on the BBQ burner because it smokes up like crazy!! If you don't have one outside, make sure you use the hood fan. About 5 minutes on each side about does it, and serve. Spicy, easy and delicious!